If you're in the U.S., there's a good chance you've seen this pair of Sherwin-Williams paint chip commercials, produced by New York ad agency, Buck. I thought our international pals would enjoy them too, as they're really very clever. Admittedly, it's computer animation and not true paper, but still fun to watch. 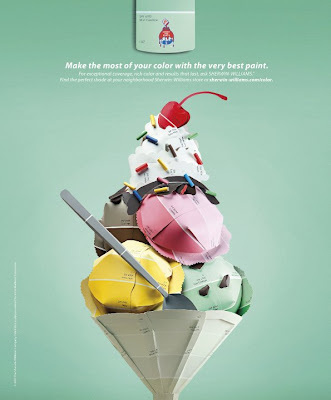 As part of the same campaign, paper artist, Matthew Sporzynski, created a series of paint chip sculptures that have been used as print ads. Matthew does lots of wonderful paper creations... you may remember seeing his work in Real Simple magazine. There's a very nice article about him at The Improvised Life. I've had this post scheduled for a while, and then last night my sister sent a link for another paper-themed commercial she had just seen. It's for Biotrue, a contact lens solution which she didn't know I had started using a few days ago, so that was even more of a coincidence! 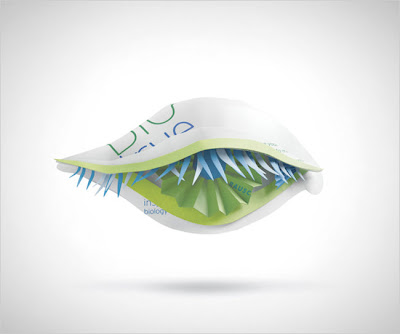 The nifty ad features an eye (of course! ), the great outdoors, a lightbulb moment, and even some kanzashi flowers petals... all done as cut paper collage. I just love those Shewrin-Williams spots - such genius. 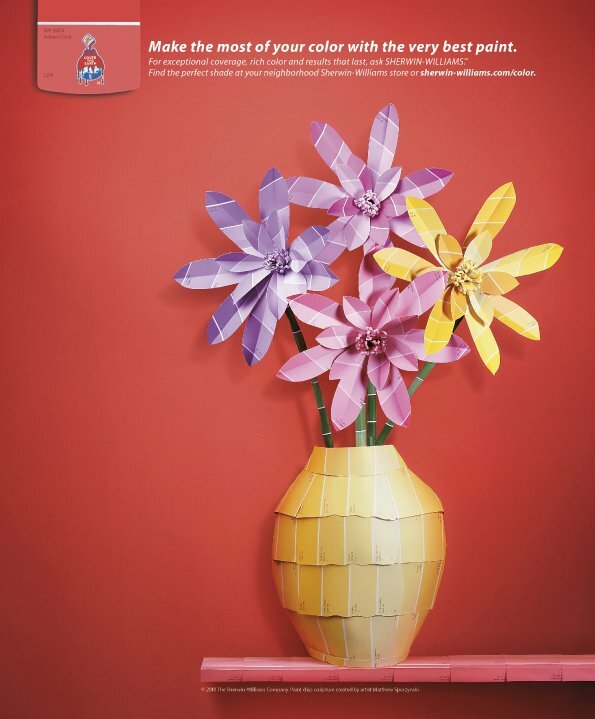 And I agree - those *do* look like paper Kanzashi in the Biotrue ad! Thanks for sharing the commercials with us Ann, It was a pleasure to watch them. The eye is definitely my favourite -so very creative. i love love love those sherwin williams paint commercials, they are so fun! Those are very cool commercials. So creative. Thank you for sharing those ads for your "international pals" ! They are genius; I'm not sure which one is my favourite but I feel a trip to the paint shop may be in order this weekend! Hello Ann, always fun and interesting to read your posts. I wanted to let you know that I have given you the "Sweet Blogger Award". Glad you enjoyed the ads, everyone. Thanks Antonella - much appreciated! I love those commercials too, Ann! They inspire me to think out of my box more often! So many things you can do with paper (or pieces of colored things) that make the product even more interesting because of the item used to create it. I love these commercials. Thanks for sharing them here. I *love* that Biotrue commercial - I see it many mornings during the news while getting ready for work. I always stop what I'm doing to watch!